Successfully Added 4 Port USB Hub With Illuminated Fish Tank + Pen/Phone Holder to your Shopping Cart. Keep your desktop organized and add some color to your life with this 4 port USB hub with illuminated fish tank and pen/phone holder. This USB hub features a blue liquid fish tank with two real fish inside! OK, so they are not real fish… But, they do look really nice when illuminated by the color changing red, blue and green and LED lights! 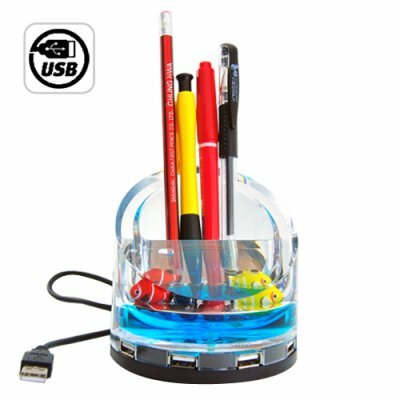 This decorative USB 2.0 Hub also features a storage area behind the fish tank to store your pens or to hold your cellphone. Order a few today at our extremely low wholesale price and we will ship them out by tomorrow! Note: This great new product is available with factory direct low china wholesale price. It is stocked in our warehouse for immediate order fulfillment and worldwide shipping to any destination whether it's you or your customer. Plug and play for all operating systems. No software or drivers necessary. Can I get my company logo printed on this USB hub? Sure. If you would like to order 2000 pieces or more then we can arrange that for you. Just let us know when you place your order.